Your knock is answered. The doorman is dressed in a traditional Victorian double-breasted waist-coat. He wears an old timepiece tethered to a chain fastened to his lapels: Sean Hoade, I imagine. And if you’re on time and have proper manners he’ll give you the lay of the land, a taste of the finest wine, and all the bread you can manage to stuff down your gullet. that I took out a loan against my home so I could afford the loads of cement and iron that constitute the floor and walls – and the strongest chains and posts. And this is where I’ve kept the terrible eldritch beast, whose very shouts drain the air of its blood and make it quiver. Now I hadn’t a penny left for anything. But since I heard the Old One can invade the collected consciousness of a civilization, that its psionic energies float across space and time like the forces themselves, without a physical substance or presence, I took the handful of coins that I could scrounge up, from the cushions under my couch and behind the wardrobe of my mother’s vanity, and I paid fours dollars and fifteen cents for aluminum foil and a large bag of Cheetos. I started on the latter immediately. Then I wiped my hands on the leg of my jeans and tore into the foil, worked it onto an old Houston Oilers ball-cap and put it on. Now I approach the Old One and it whips its huge head and watches me. The feelers on its face stand on their ends and writhe, but they terminate on narrow ends like blackened teeth. And then he’s completely still, but there’s this rumbling from within him like thunder, churning through the dark bowels of the clouds. The eyes rest where the setting sun has failed to reach. As they neared the sunken city of the Enemy, Johnny noticed that of any two perceptions, that which was more nauseatingly terrifying more and more often proved to be the one that was real. — From Deadtown Abbey, written by Sean Hoade. I’m reminded of Monty Python’s King Arthur and his squire, Patsy, galloping along on invisible steed, a sort of quiet comedy that persists and settles – which is a genius device. And it works the same as the crying violins and crashing pianos that tend to support horror film, or in this case — horror fiction. One of the great strengths, as a matter of fact, when it comes to Deadtown Abbey, is this same unobtrusiveness. And it saunters on throughout the read. Think of it as a literary thermostat, controlling the temperature of the experience, so it’s doesn’t take itself too seriously – nor does it offend the court-jester as far as he can vomit. The story, anyway, which takes place in the early 1900s, is about the daily doings of a traditional English monarch: diplomacy between countries, the working of hands towards marriage – and how these nodal events are undermined by opposing theologies between classes – and, of course, zombies. More interestingly, however, is the connection that the supernatural has with what becomes the primary antagonist, the body and mind of Cthulhu – a presence that, even beyond the farce that dominates the prime real-estate of the book’s pages, takes on its own life and substance – and so much so the story doesn’t seem big enough to contain him. I have Deadtown Abbey to blame, regrettably the most intimate experience I’ve had to date with cosmic horror, not that the story itself reads that way — but it does beg a different type of response. And because of its unholy union with black-comedy the affect is different still. Put simply, the experience was new and refreshing for me. There’s a flipside of this coin though: because the writing has been left to cool for quite a while, and becomes lukewarm on the cooling rack — this being so for both story and prose. And because it teeters on the fence between what is dreadful and what is gut-wrenchingly funny, it shuffles its feet to achieve either to any meaningful or impactful degree. Frankly, I was hoping for more before the story ended. But it becomes clear as you walk through the dirt-roads and countryside of Yorkshire that the writing’s bit off more than it can possibly chew. It’s too ambitious. Between its superficial use of traditional horror devices (e.g. werewolves, zombies, and ghouls)and its relatively straightforward (and often unbelievable) story progression – as it uses its own words to try and cover every nook and cranny of its own logic, it makes for both stale and awkward reading, more often than not. I can’t deny, however, this little book has a special charm. It’s got me interested more in blowing the dust that’s settled on Lovecraft’s hardcovers – much to its own dismay – for the talk of the Old One, for me, took the main characters of the book and tugged them clean from the spotlight on the theatre stage. 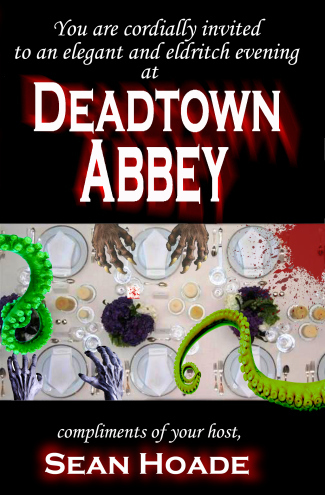 Deadtown Abbey is for the reader who, like me, isn’t addicted to sushi. It has a different and interesting taste: an enjoyable storytelling device that walks a fine line: a dark fantastical feel. And it’s lit candles here so you’re not in the dark. It cast shadows on the wallpaper that make funny shapes. The wall rumbles. I think you’re gonna need a bigger boat. And not merely because of the collected mass of the story, but because of how the imagination doth fly, or rather swim – or whatever the hell it is Cthulhu does.